One of the most overwhelming things that I’ve gotten in response to my iOS 6 review video is how to bring Google Maps back. Since Apple is now using their own maping technology they’ve eliminated Google Maps from the default app lineup. Through this simple trick you can get Google Maps back on your iPhone or iPad without having to jailbreak or hack your system in any way. Being apart of the Apple developer program I have the ability to download pre-release software from Apple before the public gets to lay their hands on it. This is purely done for the fact that iOS developers need time to make their applications compadible with the newest software and to find any bugs in the system. Since day one I’ve been using iOS 6 and had the chance to play around with the new iOS Maps, although it has some great new features it still isn’t up to par with what people expect the mapping program to work like. So when iOS 6 became available to the public recently a huge uproar for Google Maps has sparked many people to find a way to get Google Maps back. 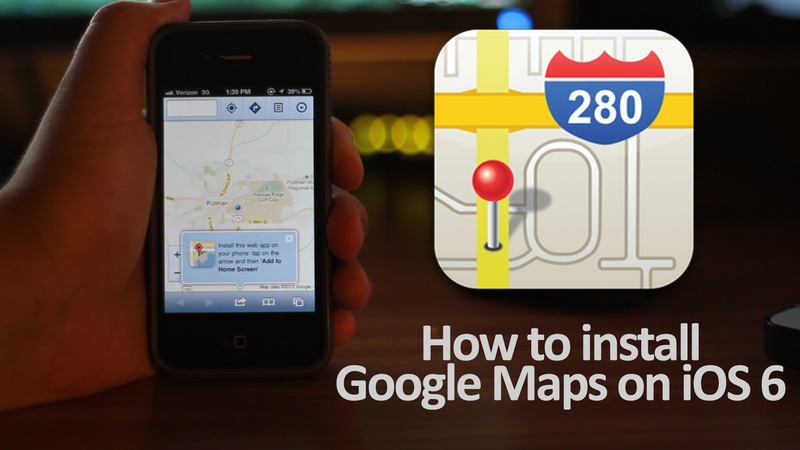 Believe it or not, it’s a simple fix to get Google Maps back on your iOS 6 device. Using Apple’s own software it’s simple to get it back to your homepage and working just like it used to. Click the center “share” button. You’ll be prompted to name it and hit “Add” when done. Safari will close and you’ll be brough to the screen that has the app. From now on you can just hit the app icon and it’ll open up Safari bringing up Google Maps instantly where you can get directions and find places of interest. It’s like Google Maps never even left your device.